LRay Villafuerte's image via his official Facebook page. NAGA CITY, Philippines - The heat was unbearable. Summer had just begun and the sun shone down mercilessly, but a small crowd of people had gathered outside Lupi National High School in San Fernando, Camarines Sur, for its 34th graduation ceremony. The event was meant to start at 2 pm, but excited students and their families were forced to wait in their sweat-dotted clothes as the afternoon wore on. Almost an hour later, the ceremonial commencement music finally started to play as a convoy of white vans pulled in – dominantly out of place as it drove through the lawn of the modest public school. Students in their white togas marched toward their seats, monobloc chairs in an open basketball court, their parents on the outer rows, equally unprotected from the afternoon sun. The rest of the guests sat on concrete bleachers on courtside. The backboards of the courts bore 2nd district congressman Dato Arroyo's name, while the tacky, bright pink and blue arch over the stage boasted: Governor LRay Villafuerte. But the man of the hour was neither of the two donors. The man on the stage – who emerged to much fanfare from his well-guarded vehicle – was 3rd district congressman and former governor Luis Villafuerte Sr. In a traditional barong that expertly hid his rotund belly, the balding 77-year-old politician spoke with authority, with a booming voice projected by large speakers which his own staff hastily wired together just minutes before his speech. He was right at home, regaling the audience. He has been doing this after all, holding public office for 35 years. And so the speech began. It was meant to be an inspirational graduation speech lauding the achievements of the youth before him, but it turned into a series of promises. He promised a roof for the open basketball court, so future graduates would not have to sit under the blistering sun. He promised to donate P30,000 to fix the school's water system. Then he lauded himself for building this school in the first place. He talked lengthily about the value of education. It is so important, he said, that all students should continue through college. Then he pledged scholarships of P5,000 each for the 75 graduates. The cash promises was unstoppable from there. Interrupted by a note from the student council president asking him to fund the class outing to a resort owned by the congressman, Villafuerte pledged P1,500 for each of the students and teachers. He reached into his pocket, took out a wad of bills worth P6,000, and handed it to the school principal to pay for 3 jeepneys to take the group there. Then another request, this time from the principal, to fund her teachers' Master's education. Villafuerte pledged P12,000 each for 16 teachers. After his speech, an intermission number: courtesy of Villafuerte's very own LRV dancers whom he brought with him, young women with long flowing hair and tight denim shorts. The LRV girls, reminiscent of television dancers in noontime shows, grooved to pop songs wearing large smiles. The dance numbers were followed by a bizarre magic show where a painting of a bird was turned into a real dove, strips of paper into edible noodles. But even the scantily-clad women were upstaged by the next surprise, the best saved for last by Villafuerte. The crowd was beyond excited now. They had gotten up on their feet, clapping and dancing to the music, when one of Villafuerte's vans pulled up by the gym. From the vehicle stepped out the most unexpected of guests, the cherry on top of the commencement-turned-concert: Winnie the Pooh and Mickey Mouse. The bear and the mouse didn't hold back from joining the party. They danced in front of the screaming crowd, at least as much as their large, synthetic bodies could manage. Children were in a frenzy, students watched in awe, while adults cheered on. And so it went on and on and on. Finally, Villafuerte's two hours amid their fanatic-inducing presence had come to an end. He walked back and forth on the stage, tossing tens of apples to outstretched arms, a trademark giveaway of the politician. Then like a dream, as the whole spectacle was, off Villafuerte went, back onto his convoy as quickly as he came, disappearing along with his magic show and mascots, cash and crew, performers and Pooh. On to the next graduation for the man who has ruled Camarines Sur politics for decades. Villafuerte knows what he is doing. He is supremely intelligent, unafraid, powerful. An important friend to have and a formidable enemy. He is sharp-tongued and curses often. He is charming and dangerous. Villafuerte is attempting to return as governor of Camarines Sur, the largest and most populous province in the Bicol Region, a position he held for 15 years from 1986 to 2004. A seasoned politician, he has allies in every corner in the province. His party, the Nationalist People's Coalition, is the dominant party in Camarines Sur. Every district is littered with schools, buildings, projects that boast his name – lest the people forget what the old man, or "gurang," as he is fondly called by locals, has done for them. But Villafuerte said he has more to do. He said he wants to head the province yet again for two reasons: times have changed, and he has things to fix. "When I ran for governor for the first time in 1986 during Cory's administration, there was no internal revenue allotment (IRA) to local government units, no local autonomy, and no Local Government Code. We relied on local revenues. 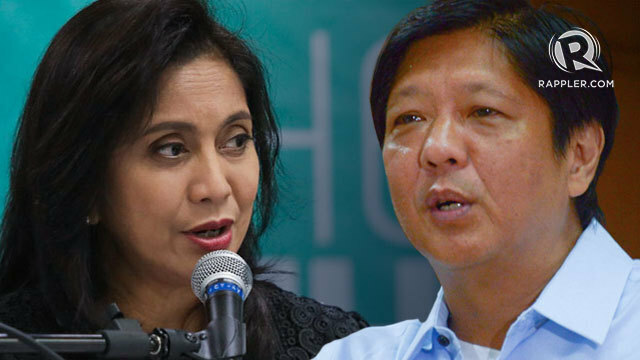 In 1987, our local revenue was P75 million pesos," he told Rappler. But now, with a large IRA, "the challenge is how to use that kind of money," said Villafuerte. Latest government statistics show Camarines Sur received P1.1 billion worth of IRA in 2010, the 17th highest in the country. The big budget, he said, attracts him to the position especially because he "accomplished more with very little money." What more now with the funds available? 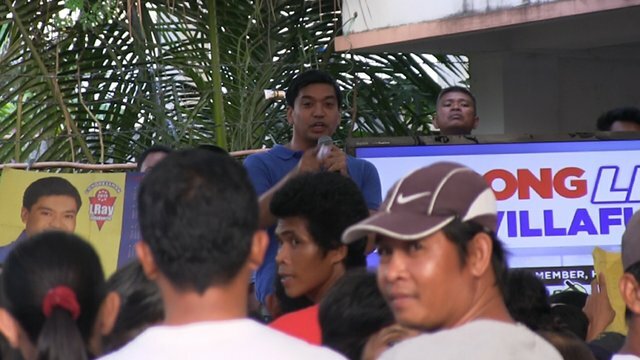 Among his platforms, Villafuerte mentioned shifting from agricultural to agroindustrial -- since close to 62% of the province's land area is used for crop production -- increasing processing, promoting the service industry, and having more specialized learning centers and state universities. This shift in economic focus has been initiated, but one he wants to continue. Much of his pork barrel has gone to scholarships for students, and to hospitals so his constituents get free medical service. But it is Villafuerte's second reason for running that has dominated headlines and intensified the gubernatorial race. "There are new developments we must attend to. Priorities have changed, there are many things the incumbent governor has done that I must rectify," he said. 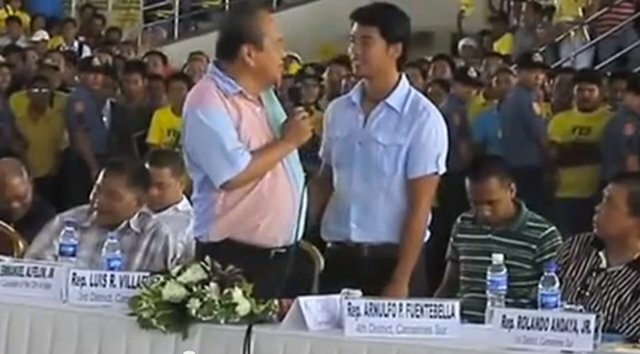 The governor is his son, Luis Raymund "LRay" Villafuerte. Father and son have barely spoken to each other in nearly a decade – a fight that, according to Luis, started when LRay took office and disobeyed his father's orders. "He is my political heir. But the first thing he did, he fired all the people who helped me in the local elections." he said. Fired up, he went on. "I set him up to be governor for two years. My projects, I just put 'LR' so he could add 'ay' and all my projects became his," he said. He shook his head, with a look of disgust in his face. "Nakakahiya (Embarrassing)," he said. 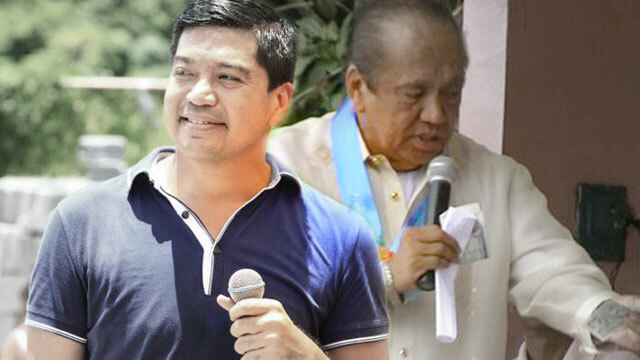 The older Villafuerte is convinced LRay has made Camarines Sur worse. Government statistics, however, shine a more positive light on LRay, who has occupied the gubernatorial seat for 9 years now. Now on his last term, LRay is fielding his son, 24-year-old Migz Villafuerte, to take his place and run against his grandfather. LRay is eyeing the 2nd district congressional seat against incumbent Rep Dato Arroyo. Since LRay, a Nacionalista Paty member, was elected governor in 2004, there have been measurable improvements in the province. The most praised is the increase in tourism in Camarines Sur, which LRay specifically worked on developing when he entered politics. 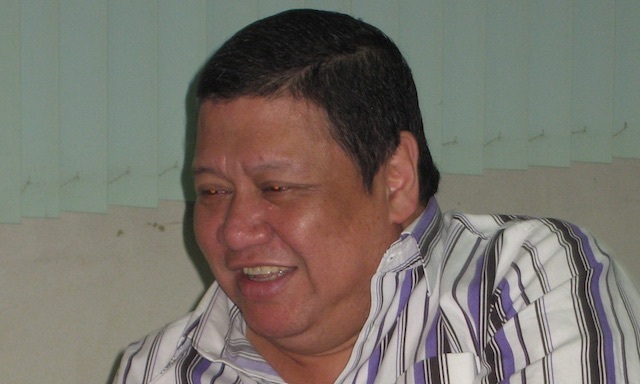 In an interview with Lynda Jumilla's ABS-CBN show Road to 2013, LRay said he was frustrated that "for such a beautiful province," Camarines Sur had such "minimal tourists." "I embarked on a tourism master plan to promote CamSur. I thought, if we're known in tourism, we will really prosper," he said. Among LRay's first projects was the CamSur Watersports Complex (CWC) in Pili, a 6-hectare water park that promoted water sports, especially wakeboarding. The CWC, which opened in May 2006, increased tourism in the Bicol region to 637,127 by December that same year. Camarines Sur got 40% of the share of tourists, the biggest in the region – largely due to visitors to CWC. Foreign tourists also increased by 65% between 2005 and 2006, from 29,969 to 49,304, according to the National Statistical Coordination Board (NSCB). Additionally, LRay has focused on promoting tourism in the island of Caramoan, which has been used numerous times by the widely popular reality series, Survivor. By 2010, Camarines Sur had overtaken Metro Manila and Cebu as the country's top tourist destination, boasting 2.33 million tourists. The reduction of Camarines Sur's malnutrition rate by over 45%, according to the 2008 National Nutrition Survey, Food and Nutrition Institute (FNRI) of the Department of Science and Technology (DOST). Migz vows to continue his father's legacy. He tells media he is young, but said he has been exposed to politics since he was a child – because his grandfather was governor for almost two decades, and his father for 9. He said he has learned from them, and said his experience of having been involved in a business since he was 17 will help him in executive duties. LRay also defends his son, saying Migz studied in the United States and has a world view. He says it is time for a new generation, a younger generation, to rule. The governor, in past interviews with media, has refused to be as harsh toward his father as Luis has been toward his son. He says he fired Luis's allies when he came into power because they were associated with irregular activities. Although he has openly criticized his father for wanting to split Camarines Sur in two – a proposal that has been largely viewed by academicians as a move for personal gain – he has expressed hope he will reconcile with his father in time. LRay credits Luis for helping him get into power in the first place, and teaching him everything he knows about politics. Despite the rift, LRay appears very much his father's son. Hours after the San Fernando graduation Luis attended, in another part of the province, LRay staged a mini outdoor rally in Minalabac town, at a basketball court tucked away in an unpaved side street. A tent roofing provided protection from the sun, while a makeshift stage stood on the dusty ground. There were few plastic chairs in the area. Most of the crowd stood on their feet, as they awaited the arrival of the governor. The backboard on the basketball court bore his opponent's name: Rep Dato Arroyo. A few speakers were on stage, local allies, but the people who braved the heat – women who carried their sleepy toddlers in their arms, unkept teenagers sucking on ice candy, scrawny, tan men in faded caps – paid little attention. Then suddenly, music started to blare on the speakers. Women in yellow tank tops and tiny black shorts on stage started to shimmy to their choreographed number, and immediately, the crowd perked up – their beloved governor had arrived. A repetitive, enthusiastic song of "LRay! Hooray! LRay! Hooray!" played on loop, as LRay, in a blue collared shirt, walked through the crowd, shook the hands of people present, and made his way on stage with a clown-like smile, eyes wide open. He waved frantically, moving to the music, before reaching his hands out to those around the stage who clamored to touch his fingers. Then he started tossing blue T-shirts to the squealing voters. There was no sign of Migz, who was in Caramoan on a mini-vacation. The rally was much like Luis Villafuerte Sr's, except at a much smaller scale – likely because it was clandestine, illegal. It was a week before the official start of the campaign period for local candidates. But with radio and television ads aired across the province and posters dotting telephone poles as early as October 2012, Commission on Elections campaign timelines and bans are largely ignored in Camarines Sur. On stage, LRay, like his father, spoke fluently in the local dialect. He went right to work. "You are the ones who will bring us to victory," he told voters. "So it's important that we talk, that we strengthen our relationship, yes? Above all, when you go home, you should have bonuses," he said. 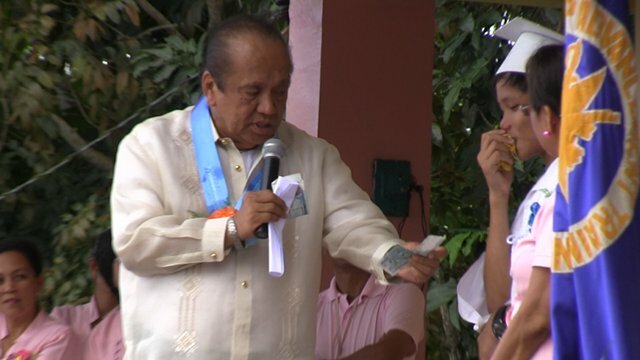 He went on to praise his work, saying he fixed the road used by the Ironman competition, an annual offering in Camarines Sur since 2009 – another event which has helped increase tourism. He said he has donated water pumps to schools, and built classrooms. He said he will continue fixing roads, and said he will even build a day care center. Then he attacked his opponent – the son of former President Gloria Macapagal-Arroyo – whom his father supports. "What did my opponent say? That I didn't do anything," he said. "My question to you is, what has he done? He built a basketball court, but there are no balls! Dato Arroyo came here, gave you school bags, right? But the school bags were empty. When I come back, I'll bring Migz along, we'll give you schoolbags – with shoes inside!" It went on. He said Arroyo gave sacks of rice to every family, but he said he would give groceries to every voter. "Not just now. But two times before the elections. Let's gather, I will help you," he said, pledging to come back in December even after he wins, to distribute Christmas gifts. He added, "That's how LRay takes care of you." Mid-spiel, LRay's eyes darted around the small space, suspiciously staring and glaring at Rappler's video camera. About 10 of his eagle-eyed bodyguards roamed the premises, some blocking the camera's lens with their burly bodies. One bodyguard whispered a request to stop filming once envelopes are handed out. A paranoid LRay started talking about spies of Arroyo. From the stage, he pointed to the video camera, waved mockingly, and said the footage would likely be sent to Arroyo. Both father and son are hell-bent on keeping power to the point of paranoia, feuds, and dirty tactics.